My notes on beer trotting - visiting places and festivals around the globe to taste great beer. 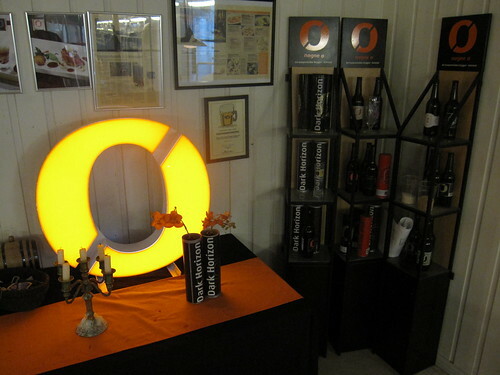 The Grimstad, Norway, based Nøgne Ø - Det Kompromissløse Bryggeri, is the biggest, best known and oldest craft brewery in Norway, celebrating its 10 year anniversary in 2012. This post is a brief account of their history and my recent, first, visit to the brewery. The tasting room at Nøgne Ø brewery in Grimstad. Nøgne Ø was founded by two homebrewers, Kjetil Jikiun and Gunnar Wiig, in 2002 in the small town of Grimstad in the south of Norway. Kjetil, a commercial airline pilot for Scandinavian Airlines, had discovered American craft beers on his many trips across the Atlantic. And that inspired him to start homebrewing in 1997.
han gjorde visst intet menneske mèn hverken på land eller sjø. In January 2002, the two registered the name Nøgne Ø - Det Kompromissløse Bryggeri, where the "Nøgne Ø", meaning "Naked Island" in Norwegian, was taken from an epic poem called "Terje Vigen" by Henrik Ibsen. The second part basically means "the no-compromise brewery", informing everyone that the brewers would not make compromises when brewing beer, neither on quality nor ingredients. In May 2003, they brewed their first beer and within a year they had a line-up of beers that included Wit and Bitter as well as American inspired beers such as Amber, IPA, Porter and Imperial Stout. The first couple of years were really hard for Nøgne Ø, because there was no market for their beers in Norway. Pubs would frequently decline Nøgne Ø's offer, complaining that such beers wouldn't sell. Still, they kept on brewing and offering their beers and slowly gained a foothold in some bars and restaurants. Gunnar was more into British and German styles and eventually left the running of the brewery to Kjetil, selling his shares in the brewery to new owners. In 2004, Tore Nybø and his sister Cecilie bought a large post in the brewery, during a critical phase when the brewery had almost stopped because of a conflict between the owners. Fortunately, the Nybøs sided with Kjetil and helped him get the brewery up to speed again. 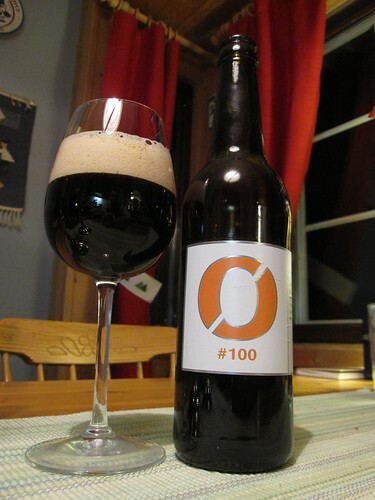 Tore, also a seasoned homebrewer, even helped Kjetil compose and brew his 100th batch - #100, today one of their flagship beers - later that year. The brewery continued to struggle over the next couple of years, but slowly started making a profit and by the fall of 2005 they had outgrown the garage they had used since 2003. With the help of a new investor they found a new brewery location - Gamle Rygene Kraftstasjon. Located on the border between Grimstad and Arendal, this old hydro electric power plant was leased for ten years and converted into a brewery. And in February 2006 the new brewery was operational. In Norway things were moving slowly, most beer drinkers and bars still went for industrial lagers and the few decent beer pubs you could find only sold craft beer on bottle, not on draft. What helped make Nøgne Ø better known in their home country was their annual Christmas beers - God Jul - which has won the Christmas beer tests in many Norwegian newspapers, year after year, resulting in many beer drinkers trying a Nøgne Ø beer for the first time. However, it was through export that Nøgne Ø started making a profit, first selling their beer to Denmark and then, thanks to the Shelton Brothers, to the large US market. For the World Beer Cup in San Diego in April 2008, Nøgne Ø submitted beers in several categories, but without very high expectations. The result was an astounding success, they took home two medals - a Gold for their Dark Horizon (First Edition) imperial stout and a Silver for their Porter! It was the first time a Norwegian brewery had won medals at the World Beer Cup, and their success made them a household name in the US craft beer market, leading to higher sales figures and collaboration beers with the likes of Jolly Pumpkin and Stone Brewing Company. This success came at a time when things were finally starting to change in Norway, by the end of 2008 a number of beer bars in Oslo, Kristiansand, Stavanger, Bergen and Trondheim had erected beer towers with the Nøgne Ø logo on them and started selling great craft beer on draft. It was a watershed, suddenly beer drinkers had non-Lager alternatives when they wanted a draft beer. From 2008 to 2010, the beer scene in Norway changed so dramatically that writing in 2012 it's hard to believe that it once was so poor! Anyhow, with the Gold medal in their pocket Nøgne Ø became a very popular brewery internationally, not only for collaboration beers (they've brewed with Dugges from Sweden, Tamamura-Honten from Japan and Terrapin from the US, to name a few) but also as a contract brewery. Mikkeller was early on their doorsteps, asking them to brew his Beer Geek Breakfast in the spring of 2008, later he added Beer Geek Brunch Weasel and George to the line-up brewed at Nøgne Ø. Another gypsy brewer to approach them was Christian Skovdal Andersen of Beer Here fame, he had the Mørke Pumpernickel Porter brewed at Nøgne Ø. Gift from Japan, a wooden sake barrel. Between brewing beer and touring for Nøgne Ø, Kjetil also spent some time in Japan to learn how to brew sake. He brought that knowledge with him, a ton of Japanese high quality rice and some sake yeast back to Norway and created a small sake brewing plant at Nøgne Ø. 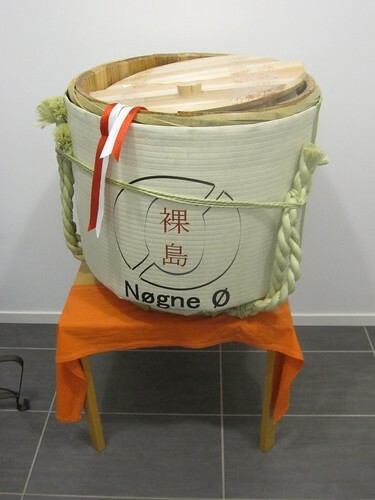 In 2010 they released three different sakes, making Nøgne Ø the first official sake brewery in Europe! As they entered 2012, Nøgne Ø was brewing and selling more beer than ever before, but a couple of tough decisions had to be made. First of all, should they stay or should the grow? The lease at Gamle Rygene Kraftstasjon, which they had outgrown, didn't expire until 2015, so if they decided to stay they could not grow much for the next three years. After much delibaration it was decided to find a new location and construct a larger brewery. 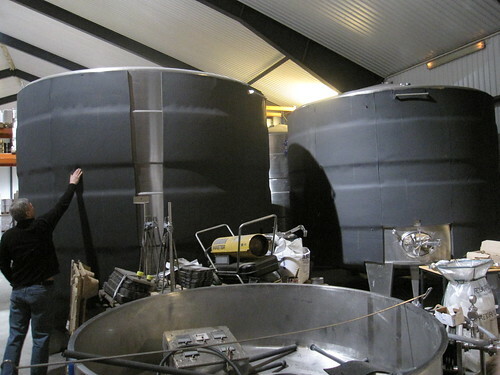 Tore Nybø inspecting new fermentation tanks. The other tough question was that of the General Manager of the brewery. Despite the successful growth since he was hired in 2010, Haldor Berge had little understanding of the beer scene and the brewing process and Kjetil felt he needed someone more familiar and understanding in that role. In the end, the choice fell on his longterm partner and part-owner, Tore Nybø, who took over the job as General Manager of Nøgne Ø on March 1st 2012, heralding a new era for the brewery. 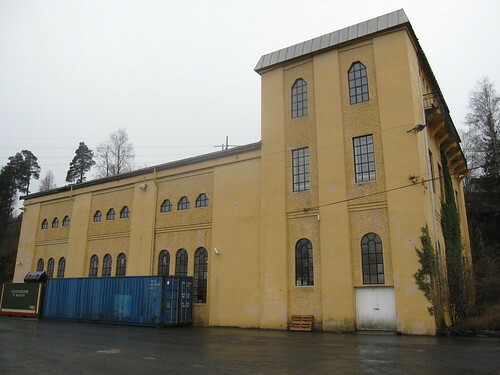 With Tore safely in the chair, Nøgne Ø is now planning ahead for a large new brewery, which will be constructed in an old boat warehouse - when the current occupants have moved out in the fall 2012. The new brewery should be operational in the spring 2013 and will feature a large tasting room and restaurant for visitors to the brewery. On my visit to the brewery in April 2012, Tore and Kjetil was busy with a number of projects for the near future. Kjetil was in the process of packing a number of different beers for shipment to the US, where they will participate at the World Beer Cup in May 2012. One of these beers is their unique Red Horizon, a 17% abv strong ale brewed with sake yeast! It will be very interesting to see how that beer is received by the beer judges, perhaps another medal for Nøgne Ø? While at the brewery I also got the opportunity to taste a brand new beer, Citrus Hystrix IPA, which is an India Pale Ale made for the restaurant chain Bølgen & Moi and brewed with rye, oats, kaffir lime (aka Citrus Hystrix) and tangerine juice! It tasted like no other IPA I've tasted before, fruity and spicy but still with a good hop bite to it. This beer will probably appear on cask at several beer festivals this spring, at least at Haand 2012 in Drammen, Norway. During the visit, Tore told us that while Nøgne Ø used to export 65% of their beers, only two years ago, they now only export about 25% - everything else is soaked up by the growing Norwegian market. Which is great news for us Norwegians. To keep up with the demand, they've hired an external warehouse where they have installed a number of large fermentation tanks. When they make a new batch of beer, they use a tractor to pull a 50 hl tank of wort up to the warehouse where they pump it onto a tank for fermentation! It's a slow and tiresome job, but it's the only way to make enough beer at their current brewery. As we're approaching spring 2012, things have never looked so good for Nøgne Ø. They've got a new General Manager, who knows and cares about craft beer, they've got a number of new beers out, the demand for their beers just keep growing and they've got the plans ready for a shiny, new brewery which should start operating in the spring 2013. Happy 10th anniversary, Nøgne Ø! Gamle Rygene Kraftstasjon - the current home of Nøgne Ø. Photos from the visit to Nøgne Ø can be found at: Flickr. PS. Because of their attendance at the World Beer Cup, Kjetil and Tore will be touring the US in late April and early May, attending Nøgne Ø beer tastings and visiting breweries. Back in Europe, others from Nøgne Ø will man the stands at Haand 2012, Copenhagen Beer Celebration and Copenhagen Beer Festival in May 2012. Dagens aksjonærer i bryggeriet Nøgne Ø selger 54,44 prosent av aksjene til Hansa Borg Bryggerier.